Coming from a major metal region and having an album on Pure Steel Records called Iron Clad Soldiers with a member flipping the 'Hawaiian peace scene' on the cover, Norway's Hjallarhorn better deliver the heavy metal goods. And they do ... in the classic early NWOBHM style. Actually, Hjallarhorn named their previous EP New Wave of Classic Heavy Metal for that is exactly what they are. Hjallarhorn wears their influences on their leather sleeves with obvious references to Kill 'Em All-era Metallica, Artillery, Blitzkrieg among others. The title track, Brigade, and The Horn are heroic and penetrating examples of Hjallarhorn's style. The peace is quick at times reflecting their nod to Bay area thrash of the same time. Hjallarhorn can also steal a page from Sabbath mixing a slower pace with heavy riffs on Blood and Black Lace (only to speed it up during some segues). Generous doses of skilled metal fret work embellish every song with acoustic guitar adding mythic qualities to Brigade and The Changeling. Dani Nilsen tries his best to sound like James Hetfield, but, in reality, can't sing to save himself. But considering Hetfield is a droning monotone and the horrible state of modern metal vocals, Nilsen does quite well with his snarling attitude. Hjallarhorn's Iron Clad Soldiers is classic heavy metal with no apologies for drawing on early NWOBHM influences like Metallica or Mercyful Fate. Bolstered by a steady rhythm section and fiery guitar work, Iron Clad Soldiers is the real deal. Very recommended. 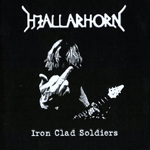 Hjallarhorn's Iron Clad Soldiers is classic heavy metal with no apologies for drawing on early NWOBHM influences like Metallica or Mercyful Fate. Bolstered by a solid and charging rhythm section and fiery guitar work, Iron Clad Soldiers is the real deal.